Subaru of America Inc. today announced a comprehensive update to the 2017 BRZ including improved handling, increased performance, more aggressive styling and new convenience features. These enhancements continue the company’s original mission of offering enthusiasts a pure sports car with an unmatched driving experience. 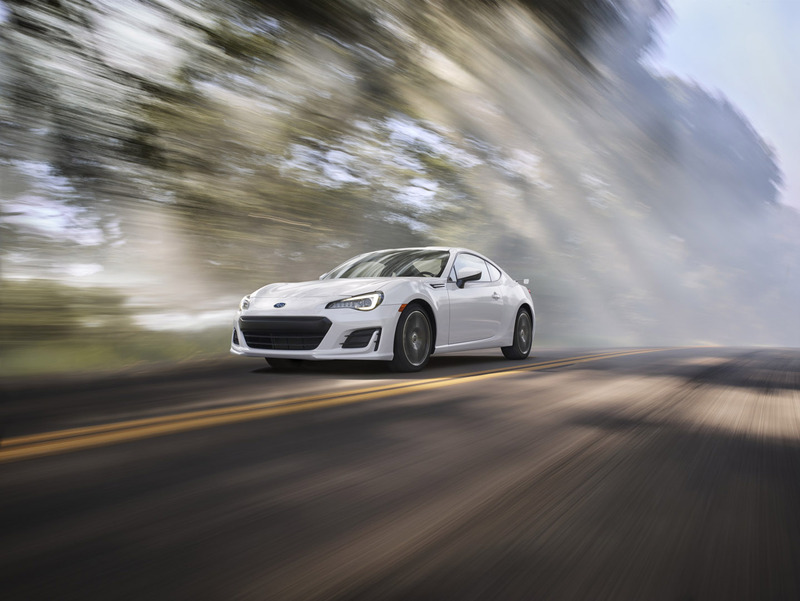 The BRZ, known for its ultra-low center of gravity and precision handling, offers several updates to increase its performance on the track and open roads. For improved responsiveness, stability and comfort, BRZ receives updated coil springs and dampers as well as a larger rear stabilizer bar. Additional reinforcements to the chassis were added to the strut tower braces, transmission cross-member plate and the rear wheel housings to increase BRZ’s rigidity. The stability control system thresholds are raised to further improve handing. The results are dramatic enough for Subaru to change the name of “Sport” mode to “Track”. 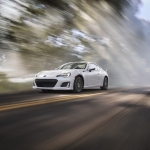 The BRZ 2.0-liter SUBARU BOXER engine receives several internal updates for friction reduction including new valves, camshaft and cylinder heads. Accompanied with a new aluminum intake manifold and redesigned exhaust manifold for increased air flow, the engine output in models with the 6-speed manual transmission is increased to 205-hp and 156 lb-ft of torque. Also, a lower final drive ratio from 4.1 to 4.3:1, paired with the standard Torsen® limited-slip differential, improves acceleration on models with manual transmission. Now standard on all models is Incline Start Assist. This system holds the vehicle momentarily in position while the driver accelerates to prevent roll back on an incline. Exterior & Interior Updates The 2017 BRZ continues to evolve while maintaining a powerful design. The front bumper cover has been redesigned for a widened appearance and positioned lower for improved aerodynamics, control, and stability. The sport coupe’s signature C-shaped headlights are upgraded to “kono-ji” style LED for improved light output and reduced power consumption. This new full-LED design, a first for Subaru, incorporates the turn signal and position light to complete the sleek new front fascia. New for 2017, Daytime Running Lights (DRL) have been integrated into the new headlights and are standard equipment on all trims. The available fog lights have also converted to LED, allowing a more compact design and greater nighttime visibility. The updated fender garnish matches the body color but with a black insert that accentuates it in profile. All trims now receive an aluminum rear spoiler in matching body color and black finish. The new pedestal design improves the vehicle’s downforce, which in turn improves stability and control. As with the headlights, the rear combination lights have been updated to full-LED for better visibility and energy efficiency. Also the rear garnish above the license plate has a new design that comes standard on both trims. The Premium and Limited models receive a new 10-spoke, 17-in aluminum alloy wheel with a high-contract black and machined finish. Focusing on the driver experience led Subaru to institute several key updates to the cockpit. New for the Limited model is a 4.2-in LCD multifunction display positioned to the right of the prominent tachometer. This driver information readout provides access to vehicle performance including lateral Gs, accelerator pedal position, braking force, steering angle, oil and water temperature, and battery voltage as well as an integrated stop watch for recording lap times. The redesigned leather-wrapped steering wheel has a firmer, sportier feel along with new audio controls and multifunction display switches for greater control and convenience while driving. Paddle shift control switches are also standard on BRZ Limited with the optional automatic transmission. Limited model interior upgrades also include a wrapped meter visor, updated HVAC control panel updated, and “BRZ” embroidered in red on the front seatbacks. Performance Package The 2017 BRZ now offers the Performance Package for drivers who demand even more from a sports car. The Performance Package is available on the Limited model with the manual transmission and includes Brembo® calipers and larger rotors on both front and rear brakes. This advanced braking system gives BRZ a significant boost in stopping power, fade resistance, and pedal feel. SACHS® Performance shock absorbers are added to all four corners for improved ride and corning stability. Also included in the package are unique 17-in x 7.5-in black aluminum alloy wheels. Two Trim Levels: Premium and Limited Subaru offers the 2017 BRZ in Premium and Limited trims. 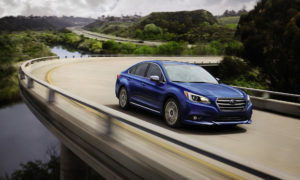 The Subaru tradition of outstanding value is evident in both trim levels with their long list of standard amenities. Key among these is a comprehensive infotainment configuration anchored by the standard SUBARU STARLINK™ 6.2” Multimedia System that includes: 6.2-in. high resolution multi-function touch screen display AM/FM stereo and HD Radio® Single-disc in-dash CD player with 8 speakers Subaru STARLINK smartphone integration with Pandora® and Aha® Subaru STARLINK apps including iHeart® Radio and Stitcher™ Bluetooth® hands-free phone connectivity and audio streaming SiriusXM® Satellite Radio and TravelLink™ Rear vision camera The Subaru BRZ Limited offers additional comfort and amenities while still keeping vehicle weight low. Externally, the BRZ Limited is distinguished in front with LED fog lights and standard All-Weather Package that includes dual-mode heated front seats and heated side mirrors. Inside, the seats are upholstered with Alcantara inserts and leather bolsters. 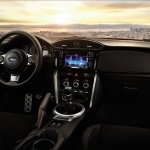 The BRZ Limited substitutes a dual-zone automatic climate control for the Premium model’s manual HVAC system, and Keyless Access with Push-Button Start enhances both convenience and the sporty attitude. A full security system augments the engine immobilizer that is standard in the Premium model. In the Limited, the dual visor vanity mirrors are illuminated, and front door courtesy lights illuminate when the doors are opened. Paddle-shift control switches that are standard on BRZ Limited with automatic transmission. Safety Subaru’s Ring-shaped Reinforcement Frame safety structure, proven in all Subaru models since its introduction in 2000, forms the foundation for crash protection and occupant safety in the BRZ. The compact SUBARU BOXER engine enhances safety by allowing more crush room in front and on the sides. High-strength front seat frames provide increased protection against whiplash injury in a rear-end collision. For protection inside the vehicle, the Subaru Advanced Frontal Airbag System utilizes dual-stage-deployment driver and front passenger airbags. Deployment strength depends on the proximity of the driver to the steering wheel, and whether there is a child or adult occupying the passenger seat. Front seat side pelvis/torso airbags and side curtain airbags offer additional security for front and rear occupants. Subaru designs cars that are fun to drive and give drivers a sense of excitement through each and every turn and this tradition continues with the 2017 BRZ. The Premium and Limited models will begin arriving at retailers in early September while the Limited with the Performance Package will arrive at retailers Winter 2017.